Upholstered armchair, XF265, one of a pair with XF266, English, probably George Oakley (1773-1840), c.1827, mahogany with leather upholstery and brass castors.©Sir John Soane's Museum, London. Photograph: Hugh Kelly. With tub back and sides; the arms terminate in paterae with reeding continuing down the front of the lyre-shaped and across the front seat rail; upholstered in the same leather as XF106, XF263 and XF264, with buttoned backs; short, square sabre back legs and turned, moulded tapering front legs, with a triple bead moulding at the top of each front leg; the two front legs have flat ‘capitals’ and in the ‘spandrel’ between the top of the leg and the seat rail is a carved bell-flower or lotus detail; all the legs have brass castors. Pair to XF266. These chairs are not present in the views of the Library and Dining Room of 1822 and 1825 but are shown in those of 1830. They are probably the ‘pair of Library chairs cover’d [with] Morocco £16.16’ purchased with ‘2 extra cushions £2.12’ and ‘A fire screen £3.15’ from G. Oakley at the ‘Bazaar’ on 15 March 1827.1 They may have been commissioned by Soane as the turned front legs seem a variant on those common to the furniture supplied by Robins, for example the trellis-back dining chairs (XF113 etc,). 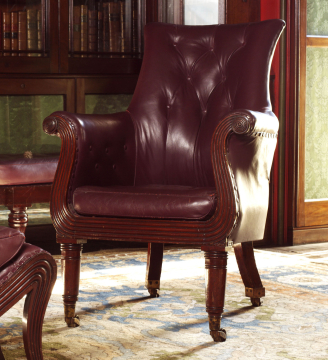 In the Furniture and Fittings inventory of 1837 these chairs are described as ‘Easy Chairs, covered with purple leather’. The pair of footstools (XF263 and XF264) are upholstered en suite with them but are listed separately in the inventory, suggesting that they were at that time placed elsewhere in the room. They were not purchased with the chairs. 1 SM Archive XVI.A.4.4: the back of the bill has a printed letter head within a circle ‘horse Bazaar / King Street / Portman Square / for the Sale of Horses & Carriages …’. Bill endorsed on back in Soane’s hand ‘G. Oakley for Chairs & Screen &c. £30.1.0. For George Oakley see DEFM. The ‘Bazaar’ started out as an establishment selling horses – usually known as the ‘Baker Street Horse Bazaar’ as far as I can find out. ‘National History and Views of London’, 1834, p.104-105 says ‘most extensive bazaar in Europe’ and describes it as selling horses and carriages but also having a ‘fancy bazaar’ on the same premises, ‘admirably conducted’ and with ‘well-stocked counters’ which remind visitors of ‘the tales of Arabian fiction, when Bagdad [sic] and Balsora were the great marts of the East’. Knight’s London, 1842, says it contains ‘a large array of carriages for sale. But it has somewhat fallen off from its original character; for … Horses are no longer exposed here for sale; and the chief commodities displayed are carriages, harness, horse-furniture and accoutrements, furniture, stoves, and ‘furnishing-ironmongery’. 2 Inspectress’s Report, page 1.